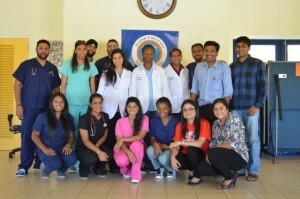 WILLEMSTAD – According to Dr. Sateesh Babu Arja, Executive Director of the Avalon University School of medicine in Curacao, they were fortunate to be able to establish a medical in Curacao. “The support we received here in Curacao is incredible,” the doctor stated. “As a medical educational institution on the island, we always would like to give something back to the Curacao community. 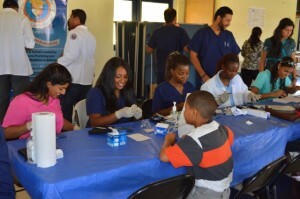 We conduct a health fair for the Curacao community twice or thrice in a year. We screen the public for blood pressure, blood glucose and body mass index and we counsel them on these common ailments. Last time we conducted a general health fair was on Saturday, February 15, 2014 at Mangusa Hypermarket and we screened 300 people on that day. We use this data for epidemiological analysis and research purposes. Again, we conducted a health fair for students present at Kinderoorden Brakkeput last Saturday March 15,” Dr. Arja indicated. The medical students screened fifty Kinderoord students for blood pressure, blood glucose and body mass index and provided the necessary counseling.